Børge Solem one of the masterminds behind this wonderful resource for the family historian/genealogist, began this project when he was history student attending the Trondheim University. In recent correspondence with Børge he explained how the website was created. He stated: "During my study I was inspired to write a paper in connection with the business of several my great grandparents, who were emigration agents representing some of the great transatlantic steamship companies like the Allan Line, Cunard Line and others. I guess it was a natural consequence of my interest in genealogy, and as I have also been very interested in maritime history and ships, the link was easy created. I was communicating with other people interested in the same subject on the web, and started to communicate on mailing lists. I soon discovered that the information I gathered while working on my paper was of great use to many genealogists, and soon found my self answering more and more question from people who were struggling in their hunt for their Norwegian ancestors. After some months I realized that it would be a good move to put some of the information out on the web as I used too much time answering mail. Together with some friends the site was born as a simple ship index of Norwegian emigrant ship departures." The website has grown from it's humble beginnings to a powerful reference site for those genealogists/family historians. He and his friend Trond Austheim continually work on the site upgrading with new features and material. Friends and users of the site will also contribute to the content on the site providing a wide base of information. The site is available for viewing in Norwegian or English. A few of the main topics covered on this site include but not limited to: Passenger lists, Ships lists, Norway Heritage forum, and an Image gallery. 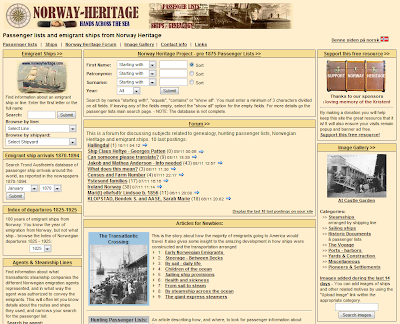 Numerous how-to articles are also available for review to assist you in your research of your Norwegian ancestors. If you would like to research the free databases on this site click Norway Heritage and you will be directed to the sites main page. Have fun and good luck in your quest!